Wes tells me that Nagaoka Zen Juku used to be a school for troubled youth - their parents would send them there to get some Zen discipline while they learned algebra, history, and other subjects. Sogen Hori, whom some of you will have remembered from our Seminar some years back, lived and trained here for a few years. 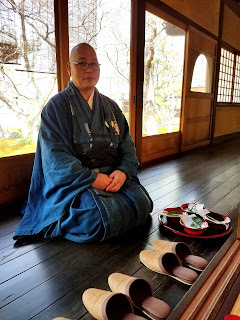 These days Nagaoka Zen Juku is a quieter place - it's just Diaun Roshi and his inji (assistant). In a few days they'll get two university students staying for at least one term. That's the same story at all the temples we've visited - gorgeous places that any Western sangha would die to have as a practice place, but with hardly anyone practicing there. Unlike many parish oshos, Diaun does teach regularly - they have service for the public two Sunday mornings and one Saturday morning a month, where he gives a teisho (Dharma talk given by a roshi) - about 10 people travel from neighboring cities to attend these, and about 10 come to sesshin, which he holds twice a year, in July and December. Diaun's English is quite good relative to other Japanese - I've forgotten his story with America, but he has one - Wes met Daiun in the States years ago, before he had entered the sodo. He encouraged us to come back, and if we bring some Zen students for a pilgrimage to Kyoto, to stay at his place. That would be fun - to wake up with Daiun, have tea, zazen, and breakfast, and then head to Kyoto. Here's are two parts of the temple complex, all taken care of by Daiun and his inji - they hire a part-time gardener or two in the spring and fall. And Daiun's inji - I can't recall his name now. I asked him how life at the temple is - he said "Hard work." I love his rakusu - it's had plenty of use. The kaihan is only about three years old - the previous one finally broke - Daiun Roshi wasn't sure how long it had been - maybe 30 years. One of the private student rooms - a bedroom and study. These next two are the dining hall - you can see there are benches stored close to the ceiling that are put together to make a table for eating. The traditional kitchen - a fire is built beneath these pots. Now there're for show - they use a modern stove and oven. But at Kennin-ji Daiun says they used things just like this. "When it was raining and the wood was wet - difficult!" I loved this room - it's the main library, in a metal lined room with a safe-like door all so the books don't go up in flames in a fire. Daiun's teacher's takahatsu hat, hanging in the entryway. After tea and a tour, Daiun led us to town and took us out to lunch. A very nice visit, and generous of Daiun to take so much time with us. I hope to see him again! Beautiful pictures! What a lovely place. Hey Sarah - yes it is. I hope to go back and visit one day before too long! I lived at the Juku for 7 months in 93-94 while studying on a student Fulbright at Kyodai. It was an amazing experience, especially as a foreigner. We had a full complement of 7 students. Sad to hear there are so few now. Nice to hear you had a good experience 25 years ago. It's a beautiful place, and Daiun Roshi was a generous host - though I assume someone else was leading the practice there in your day. Daiun does still host university students, but there were none when I visited, and it sounded like it was one or two at a time these days. Here's the link to the English language application for exchange students. 6 month minimum and some practice and cleaning requirements - and quite an experience I'm sure! I spent 6 months living in Nagaoka Zen Juku. It was a life-changing experience where hard work, discipline, meditation and quietness brings out the best in you. Great to hear - it really is a beautiful and serene place. When were you there, and were you studying? 2015, while studying at Kyoshin Language Academy, near Kyoto Station.